London, 1 August 2007 – The independent player protection and standards body eCOGRA (eCommerce and Online Gaming Regulation and Assurance) has experienced a surge of interest in its expanding range of professional services following a decision earlier this year to accept online gaming and betting operators that do not necessarily use the software of eCOGRA member software providers. “It is very encouraging from an industry perspective to see a significant number of big name applicants undergoing the inspection, probity checks and monitoring procedures we use to accredit sites for the “Safe and Fair” eCOGRA seal”, says eCOGRA CEO Andrew Beveridge. “There is no reduction in the inspection and monitoring levels, or the standards required to satisfy our independent directors before an organisation is certified. However, the policy now in force opens up our services to a wider range of online gambling operators who want to achieve third party verification that the players are protected, the games are fair, and responsible practices are implemented”, he said. Based on industry and business requirements explicitly requested by operators, eCOGRA has expanded its services to include specialist reviews and advisory services. The provision of these industry specific and specialist services is made possible through the appointment of a highly qualified team with Big 4 accounting firm experience in auditing and advisory practices. eCOGRA is drawing on its vast knowledge and capability in setting and enforcing standards to the benefit of the industry. Partnering with other organisations wanting to promote fair and transparent practices, eCOGRA is assisting these organisations by helping them to set standards and monitor compliance. eCOGRA has also recently developed standards specifically focused on the operation of affiliate programs. The main objective of these standards is being able to provide some level of comfort to affiliate marketers that they are being paid the correct amount, that accounting practices and calculations on affiliate revenues due is correct, and that appropriate controls are in place to prevent skimming. This set of standards is proving extremely popular with leading affiliate programs. eCOGRA’s reputation and ability to provide independent verification has been an important mechanism for operators wanting to provide additional assurance to players, or other third parties, that relevant information has been verified by a trusted source. Most recently, these services have included eCOGRA performing independent verification of winnings that have been published and marketed by the operator. 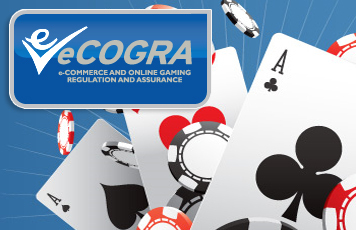 eCOGRA approved operators have benefited from receiving best practice Information Security Policy templates to assist in the protection and safeguarding of the online gambling environment. Underpinning this is the confirmation that the security configuration of the technology being used conforms to the documented policies and best practices implemented by the operator. eCOGRA has therefore designed information security review services that are performed to identify any control weaknesses and system vulnerabilities that may allow malicious users and attackers to circumvent security mechanisms on Internet gambling sites. eCOGRA is able to assist and advise operators based on extensive industry experience and knowledge, and an understanding of the unique and specific challenges facing online businesses. Financial, business process and technical skills are utilised to develop and tailor innovative solutions to assist operators in a range of business and industry related challenges. The services are designed to compliment many of the other facilities which form part of the eCOGRA offering, such as dispute mediation, responsible gambling training, and payout percentage and RNG certification. “The popularity of these services shows that there is a genuine move in the industry toward a more professional standing through self-regulation and implementation of best practice standards.”, said Beveridge. “The result is growing operator demand for audit type services that give both players and other industry stakeholders the necessary confidence in safety, professionalism and efficiency, and we have and will continue to develop a basket of services carried out by qualified specialists to satisfy this demand.